Broad Street between State Street & Lake Blvd. Yes, we ate lunch at an ice cream shop. 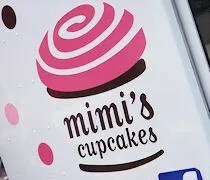 But, on the way to that ice cream shop, we passed a cupcake food truck….and as we sat looking out the window of that ice cream shop, we saw a cupcake food truck. 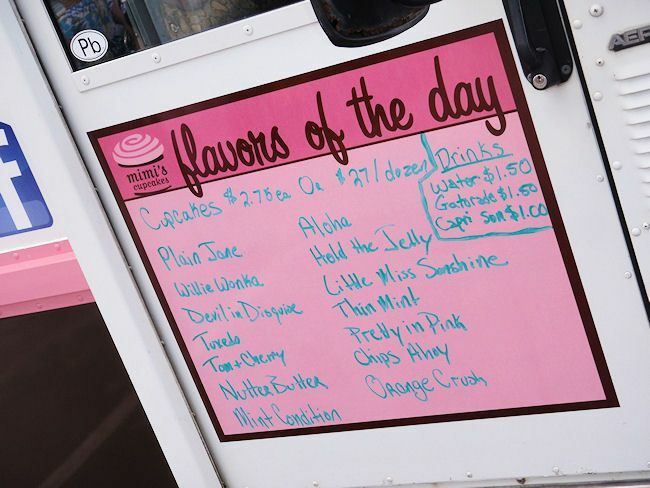 Yeah…..we didn’t get ice cream for dessert…we headed outside to said food truck. 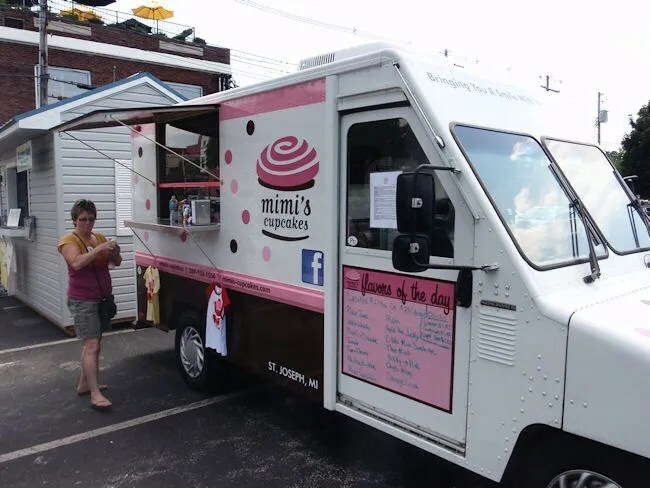 Mimi’s Cupcakes was parked in a lot on Broad Street between State Street and Lake Street in downtown St. Joseph. The brightly colored truck taunts passerby’s with the tasty cupcake creations you just know are waiting for you behind that hunk of metal. For J and I, the temptation was too much. I was the last one done eating lunch yet I was the first one to get up and walk out the door. I wanted that cupcake! I almost went super simple and ordered the Plain Jain, but just as J was walking up to place the order, I saw the Chips Ahoy. I didn’t really know what it was, but I had a feeling it involved tiny chocolate chip cookies. Yay, for me! I was right. 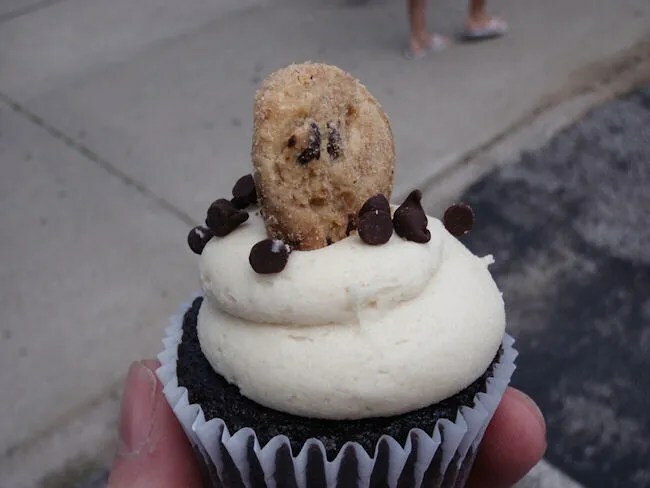 The super most chocolate cupcake was topped with a vanilla buttercream frosting, mini chocolate chips, and a tiny Chips Ahoy chocolate chip cookie. The buttercream frosting just melted in my mouth on this hot June afternoon. The bad news is the cupcakes were mini cupcakes, so I downed the treat in two bites. The good news is, it was incredibly delicious. J ordered the Willie Wonka cupcake without really knowing what it was. She just thought it sounded good. Turns out, it’s a chocolate cupcake with a creamy chocolate buttercream frosting. She lit up with delight as she took the first of two bites. 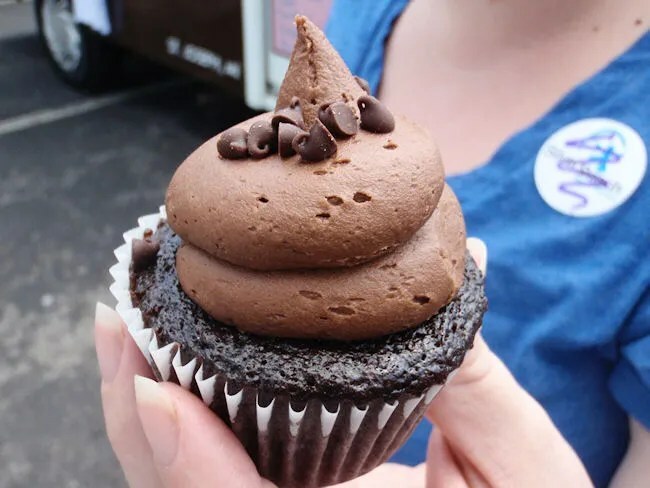 Mimi’s Cupcakes is a fantastic treat if you’re in downtown St. Joseph…hell, it’s even a great out of the way stop if you’re passing through town. The two cupcakes set us back $5.50 and it was well worth the price. If we didn’t have a crying baby in the stroller, I’m pretty sure we both would have ran back to get a couple more.